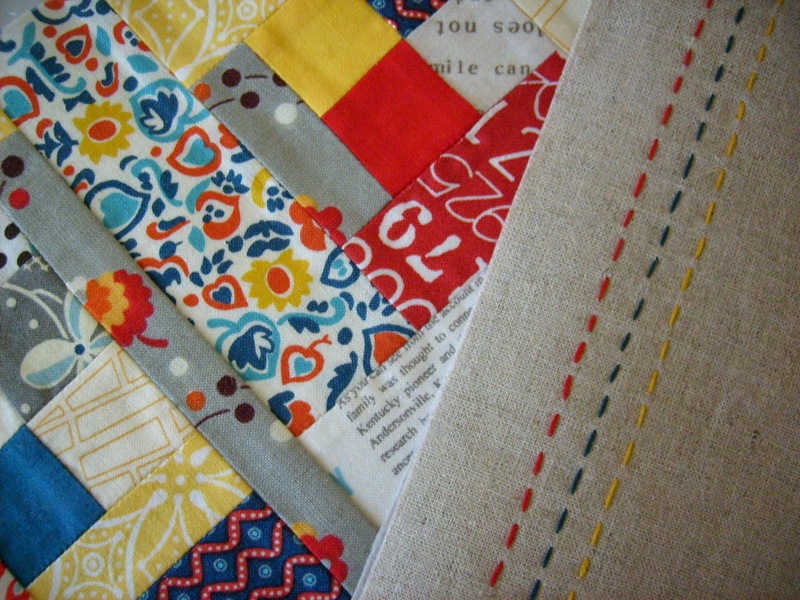 It was a long weekend here in New Zealand, so I made the most of the opportunity to finish some sewing projects. 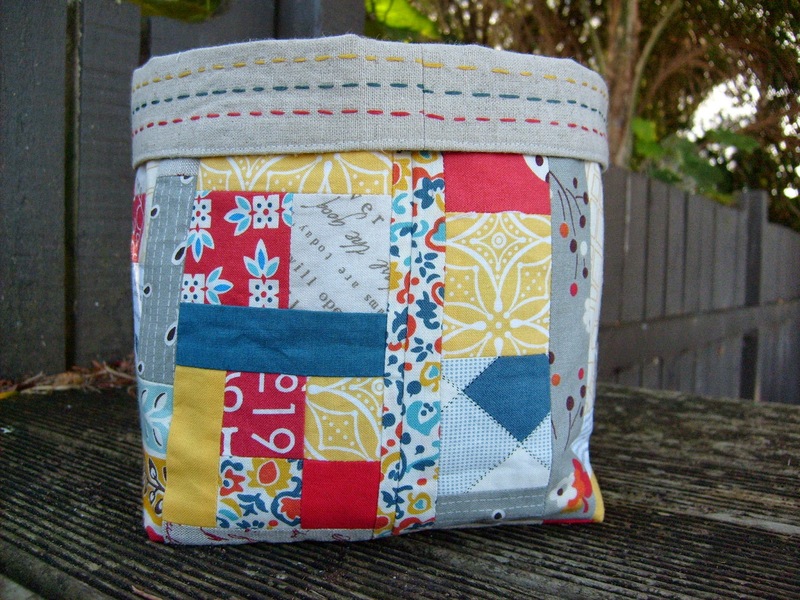 First up is a fabric basket for another swap I have joined in. 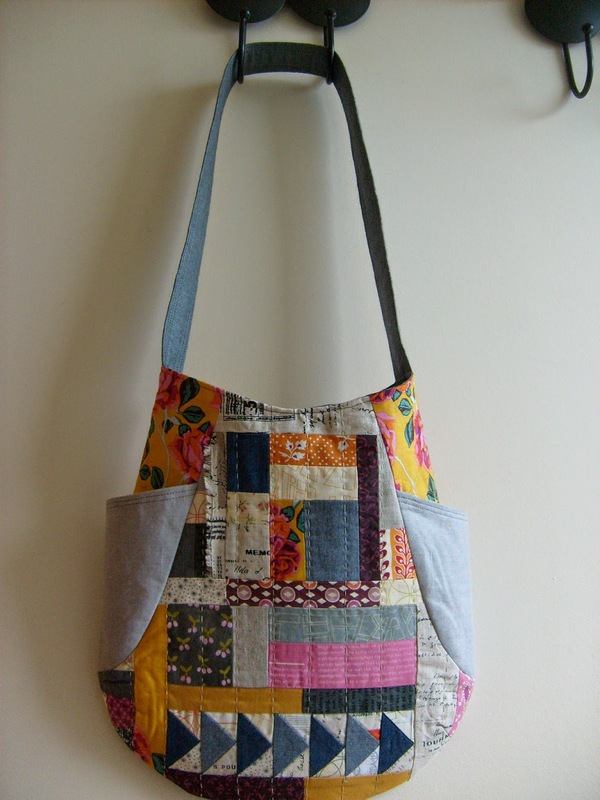 Made from various scraps of text, solids, linen and Denyse Schmidt fabrics, using this tutorial. 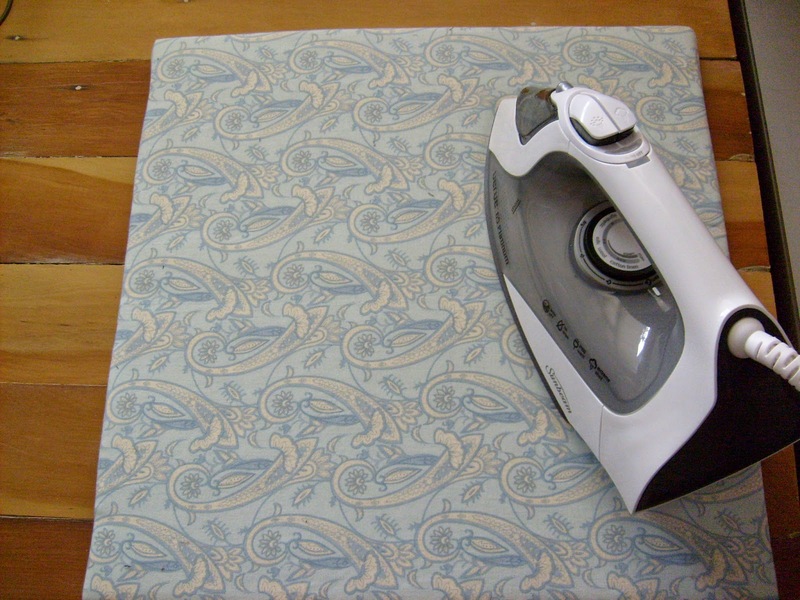 It was a nice easy pattern to sew, though I think I will use heavy weight interfacing on the lining next time I make this pattern. 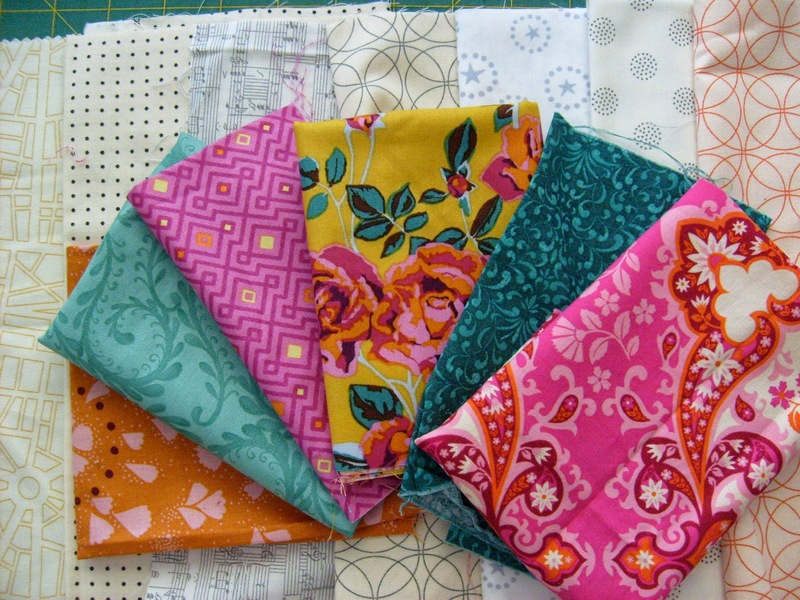 This weeks PackPatch themes were: I was born in the ..., and I would have liked to be in the ... Because I was born in the 70's, I picked paisley and green. I remember a lot of brown and orange from that time too. 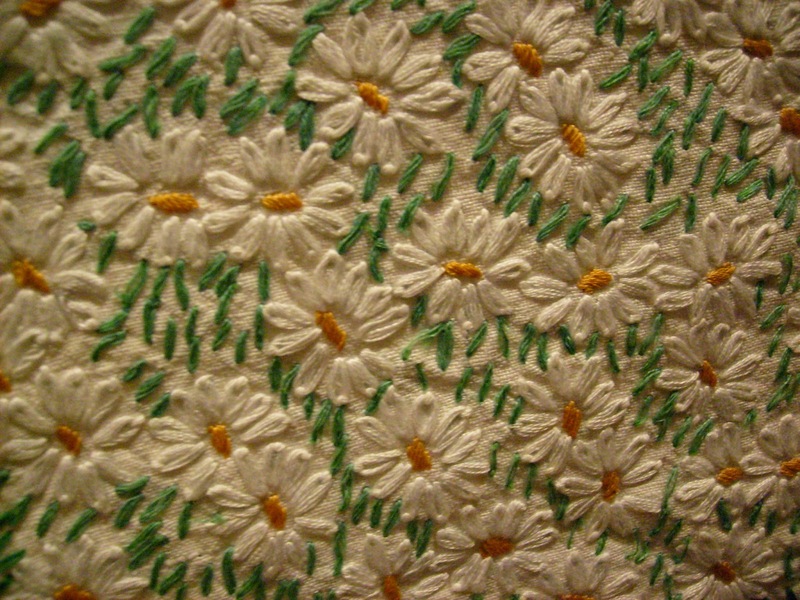 I would have liked to be in the 50's, I loved the full skirts, with big floral prints and twin sets. Not so keen on the horn rim glasses I would have needed though. 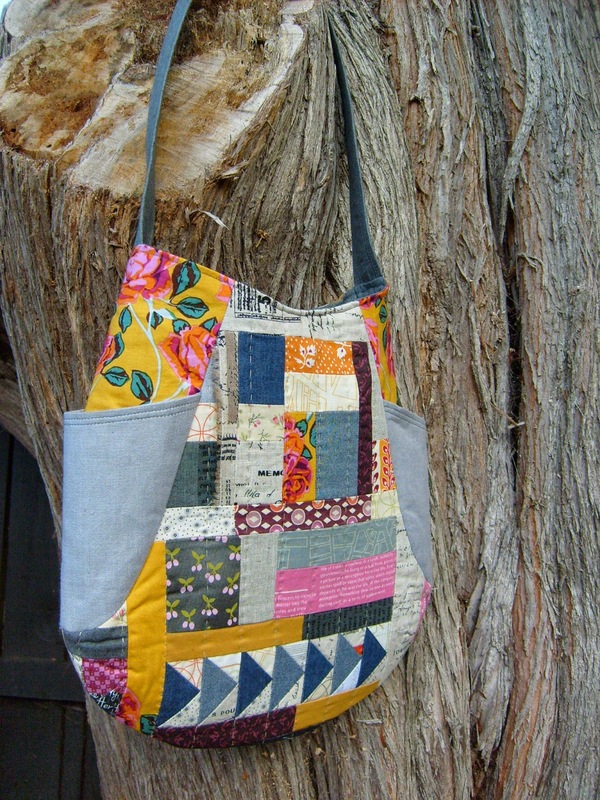 And my big TA DA moment - I finished my 241 Tote. 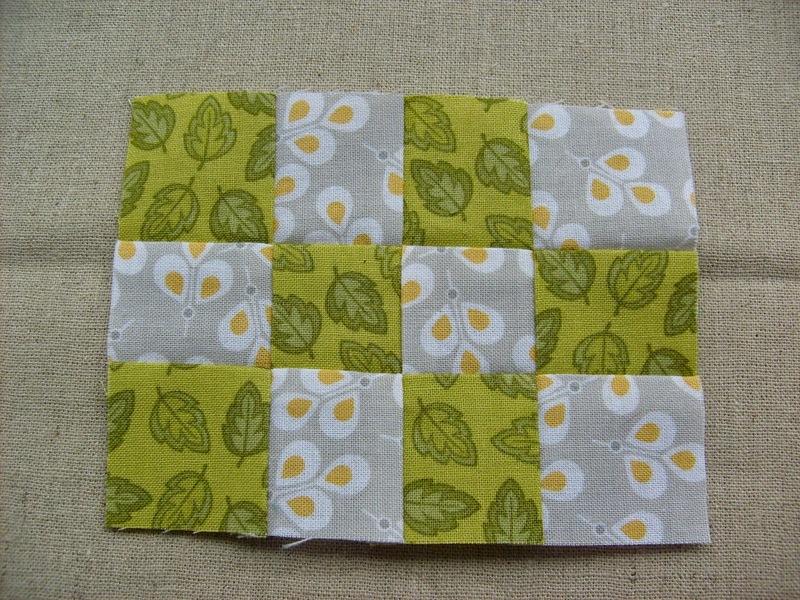 I did rows of vertical hand quilting on the centre panels in a natural linen coloured thread. The side pockets are shot cotton in a silvery grey, with AMH Social Climber as the feature side panel. The lining and strap are a charcoal shot cotton. 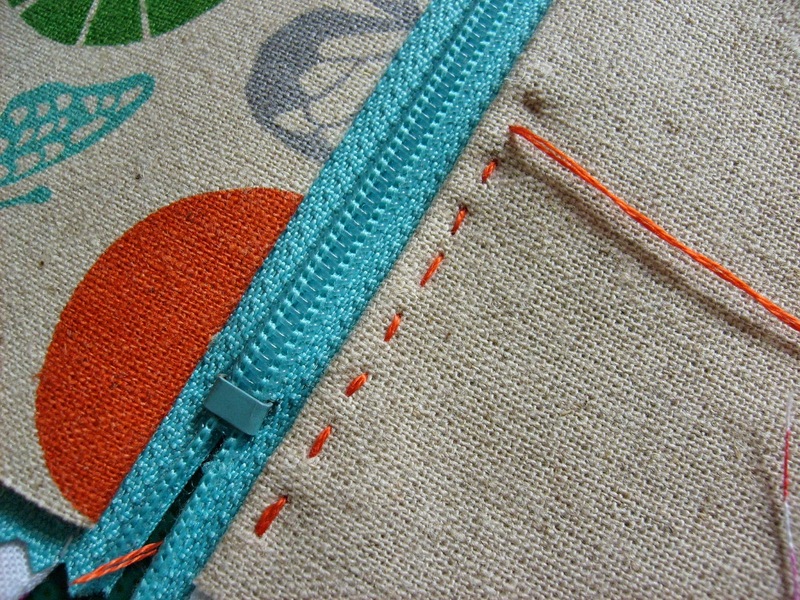 For extra strength in the strap, I also added a strip of upholstery weight cotton ticking in the middle before 6 rows of top stitching. On the whole I am pretty pleased with how it has turned out. 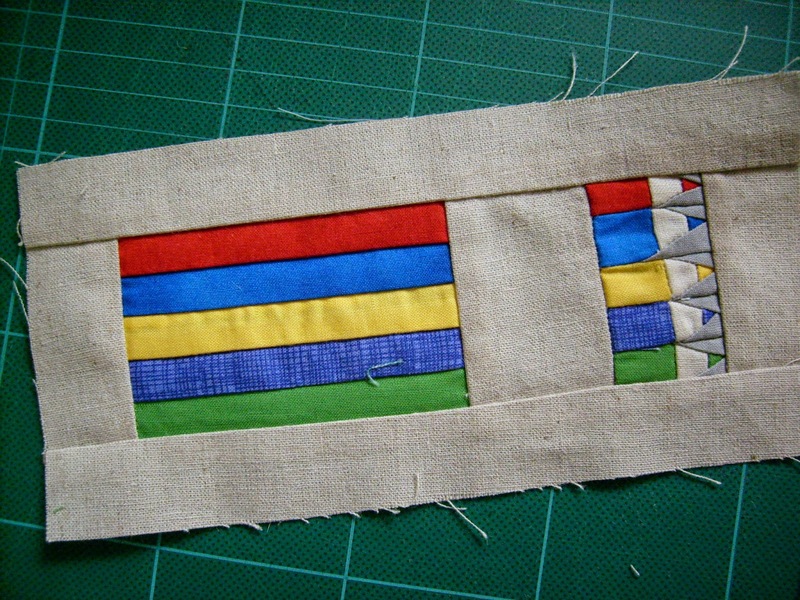 Sewing the curved panels was not an easy task, and I wasn't happy with how my top stitching along the centre panels and pockets looked, so after unpicking it, I decided to omit it. 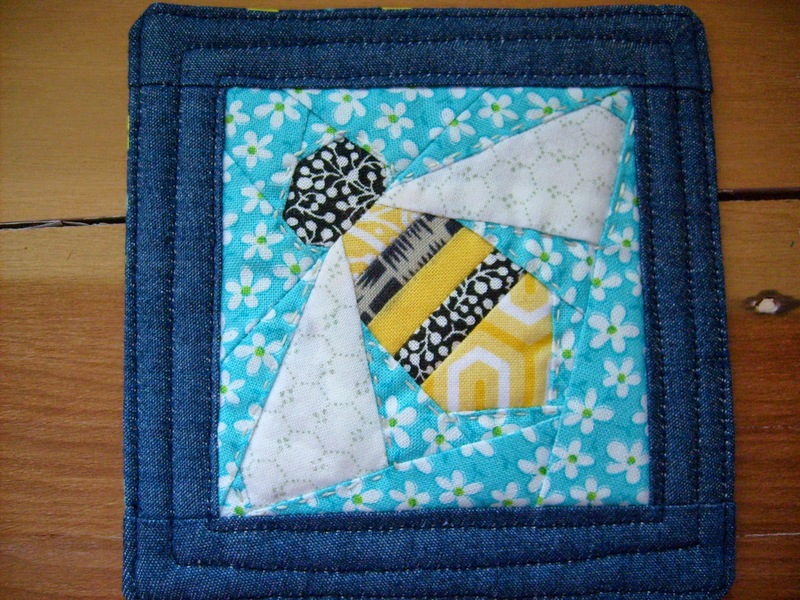 I would make this again, but I would probably not do a quilted centre panel. 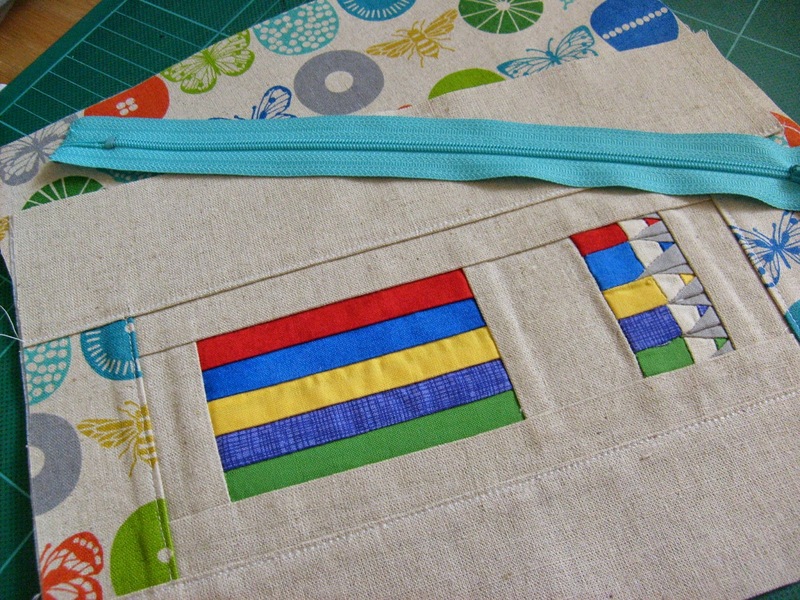 Well I have finally started my 241 Tote Bag. 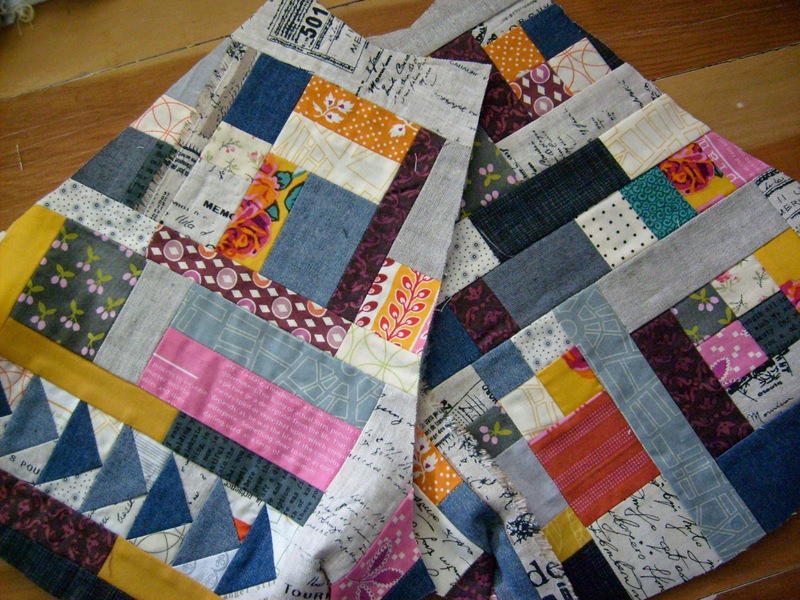 The focal front and back pieces have been pieced together, with some of my favourite quilting fabrics, shot cotton, linen and shirtweight denim scraps. 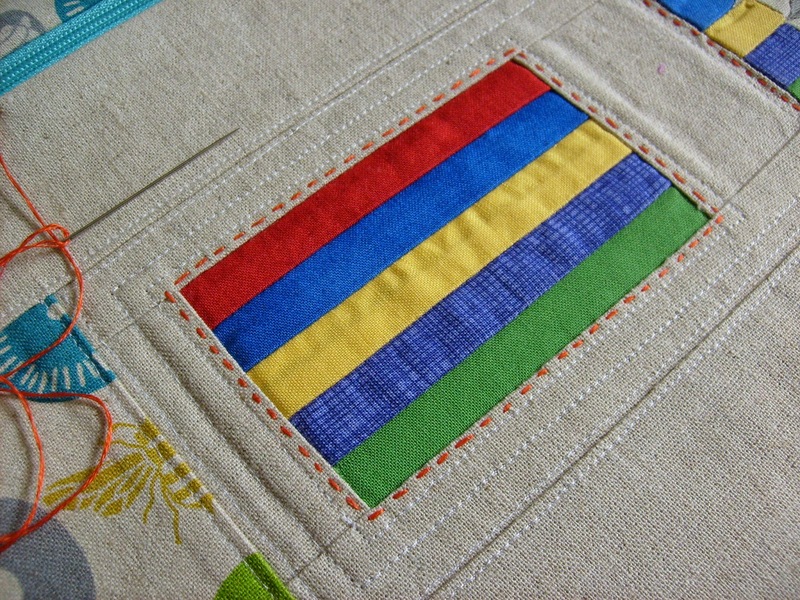 I have also used a little piece of fringed selvedge from one of my linen pieces for added texture. 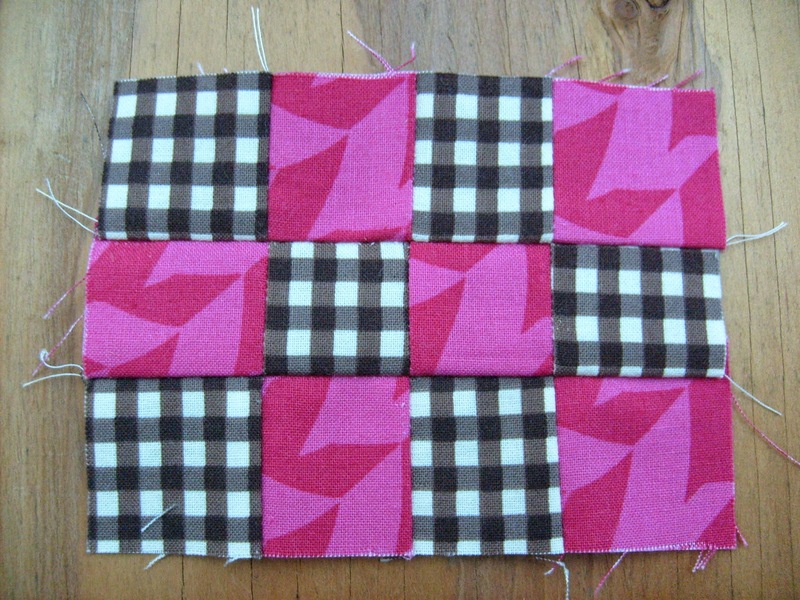 I have used fusible lightweight fleece on the back, and just need to decide whether to do some quilting on these pieces, before I start assembling the rest of the bag. 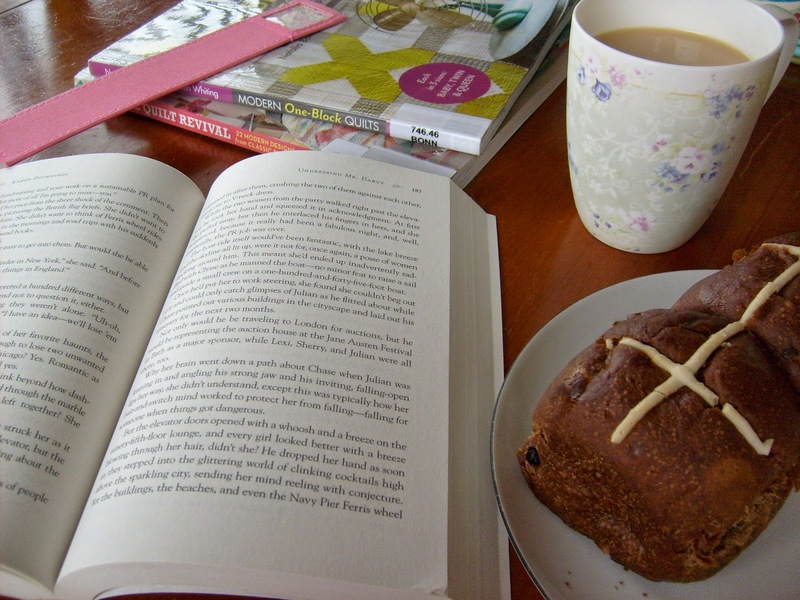 A long Easter weekend. The Scout, Miss B and Mr J are all away at an Easter Scout Camp. I had my Mum stay for a couple of days. 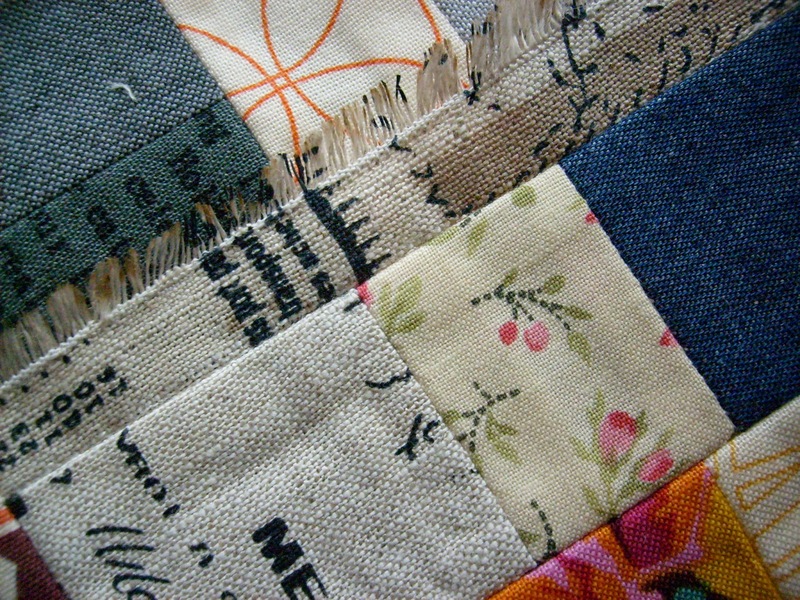 Yesterday was very wet, so lots of sewing was done and some chocolate was consumed - the perfect way to spend a rainy day. 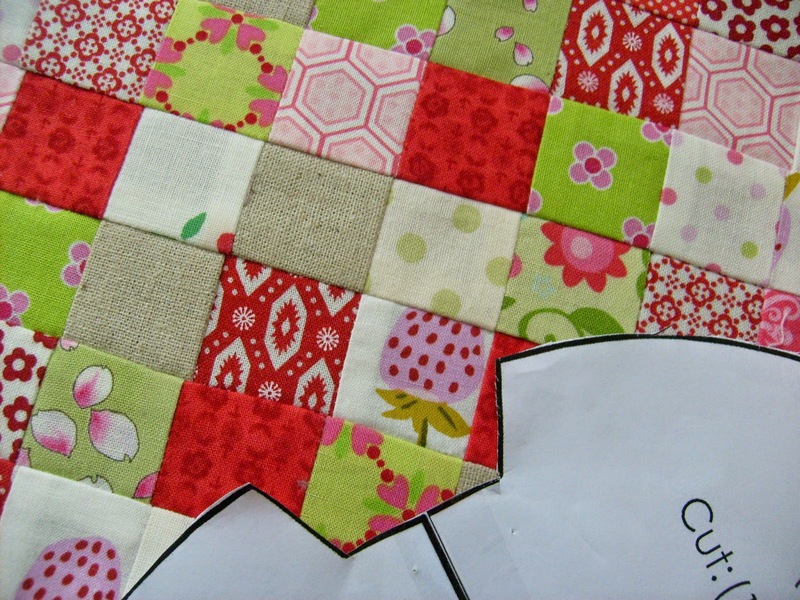 Currently I am working on a little dumpling pouch for another Flickr Swap. 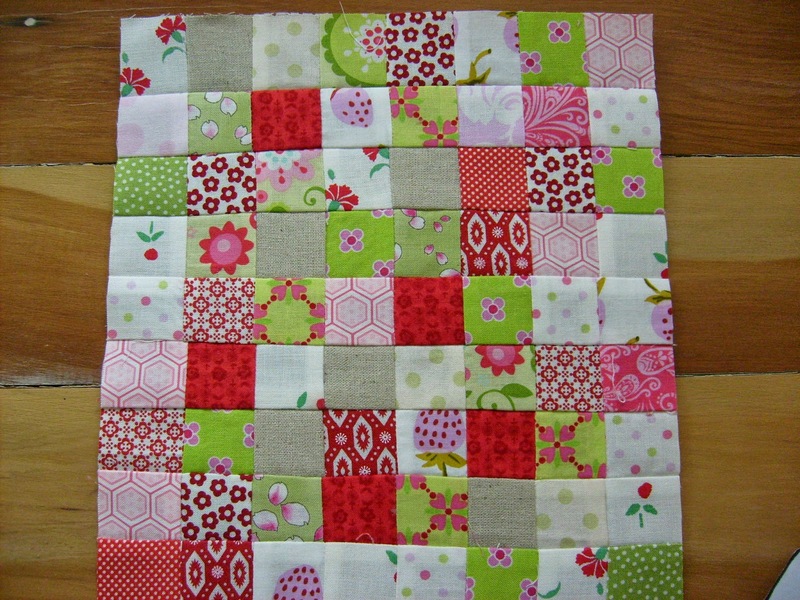 This one is strawberry themed. 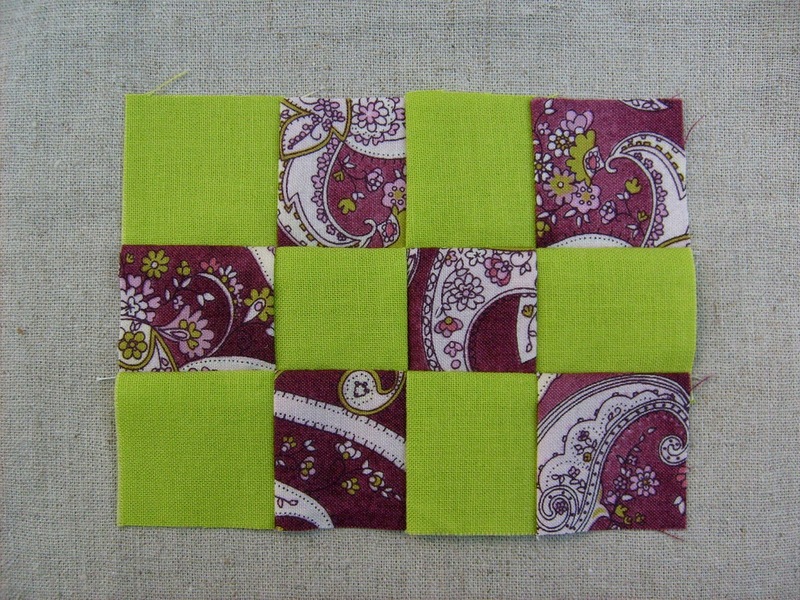 Using my partner's favourite colours, tiny 1.5" squares have been sewn together for the exterior of the pouch. 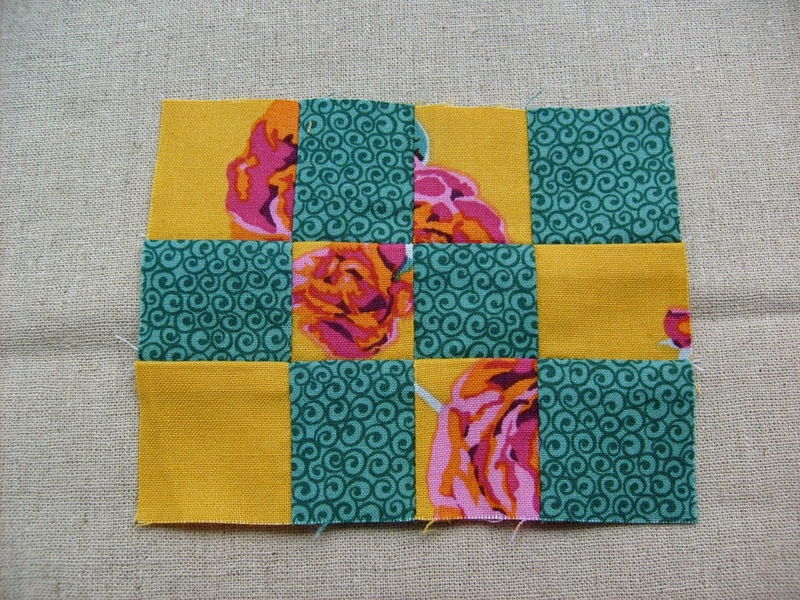 For the interior I am using some vintage floral cotton. 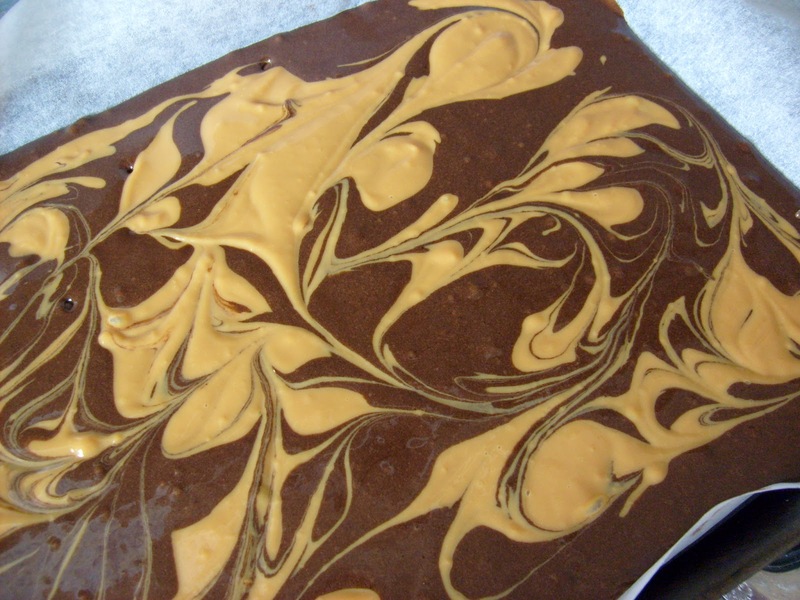 Also in progress today is a new brownie recipe/idea I am trying out. 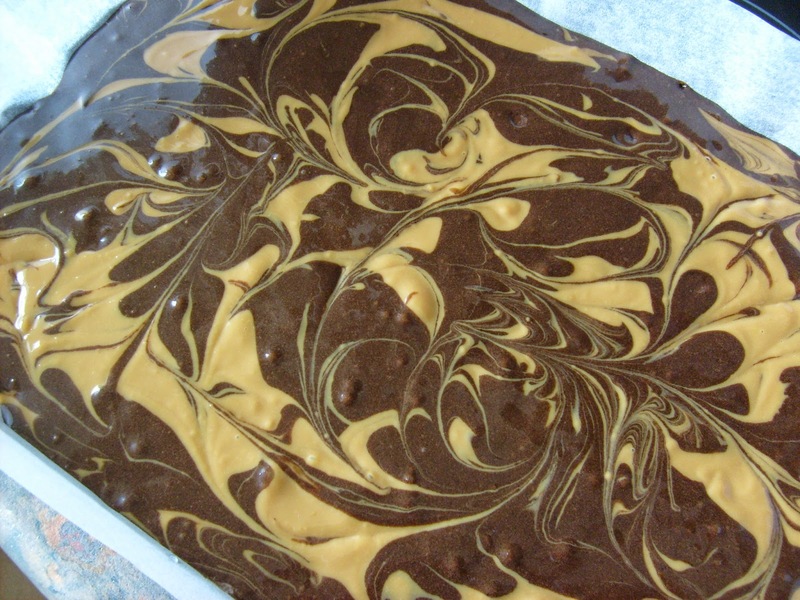 Based on a recipe I found in a magazine, I used my favourite brownie recipe, then swirled through caramel condensed milk (Dulce du Leche). I am just waiting for it to cook and then cool down before I sample it. Now I have a problem with the pressing board I made. It seems that when the board gets to hot or maybe a little moist from the steam from my iron, some of the natural wood colour has come through the batting and fabric cover and stained it. Needless to say I was not terribly impressed. Has anyone else had this problem? 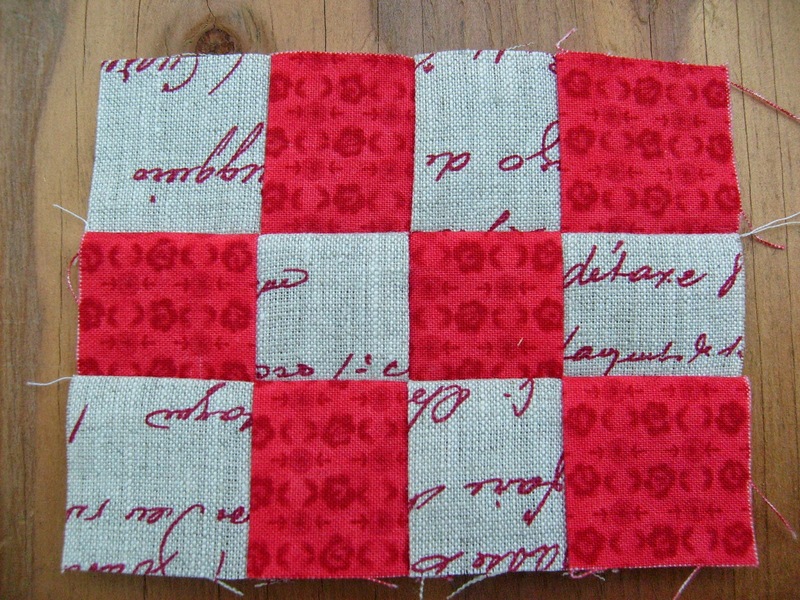 Should I have perhaps put something else under the batting and fabric first? Any solutions/ideas would be most helpful. 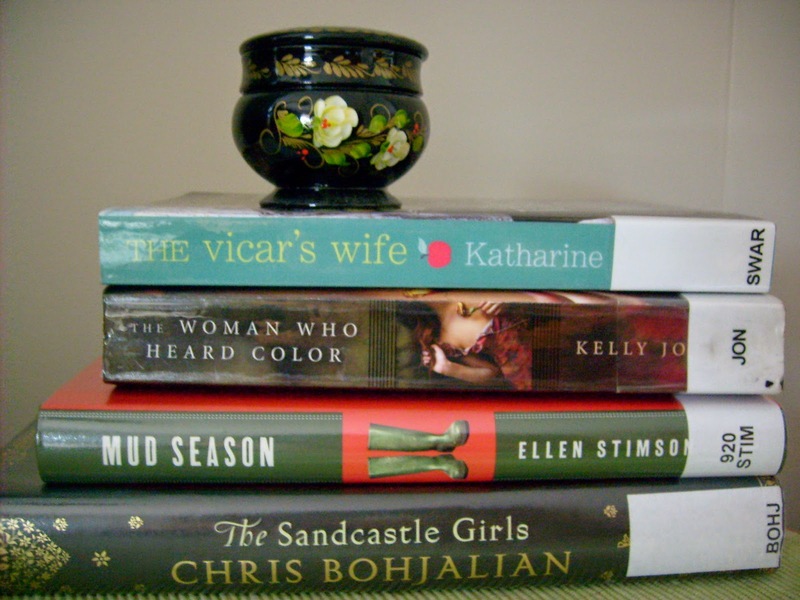 Most of Saturday I worked at the library, so when I finished, I made the most of the remainder of my weekend. 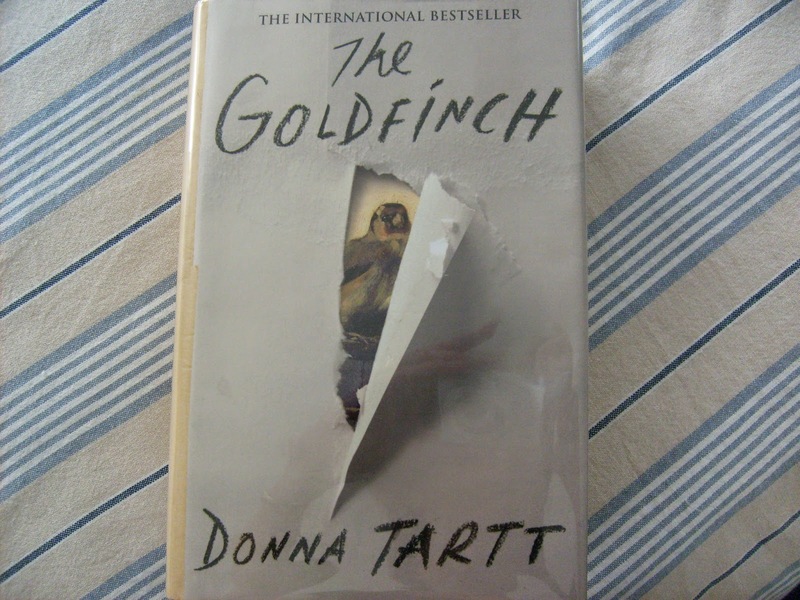 I finished reading The Goldfinch (I gave up on The Luminaries). It was an interesting, if at times, a hard book to read, but now I have a new pile of interesting books to get started on. 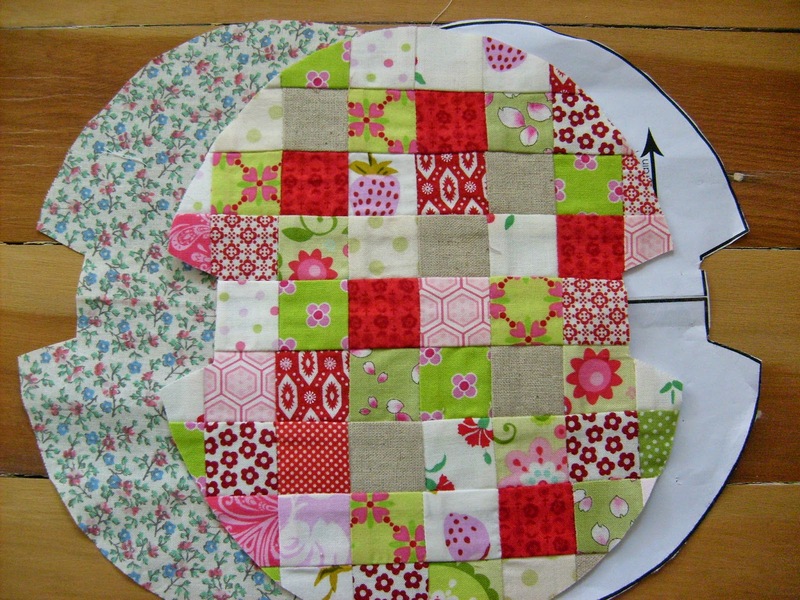 My new pressing board for my sewing table, measuring 40cm x 40cm. 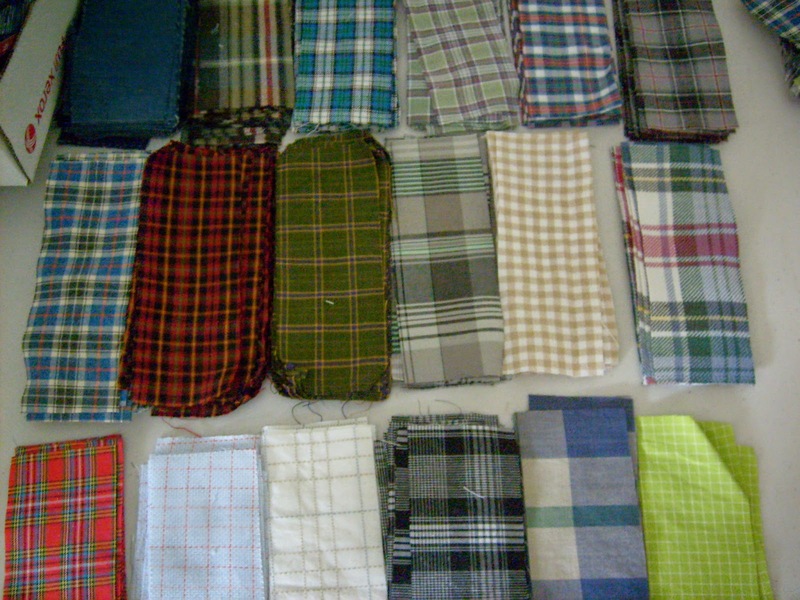 The piles of shirt strips for Mr J's quilt are slowly growing - I found a couple of almost new shirts in the shop shop on Friday. 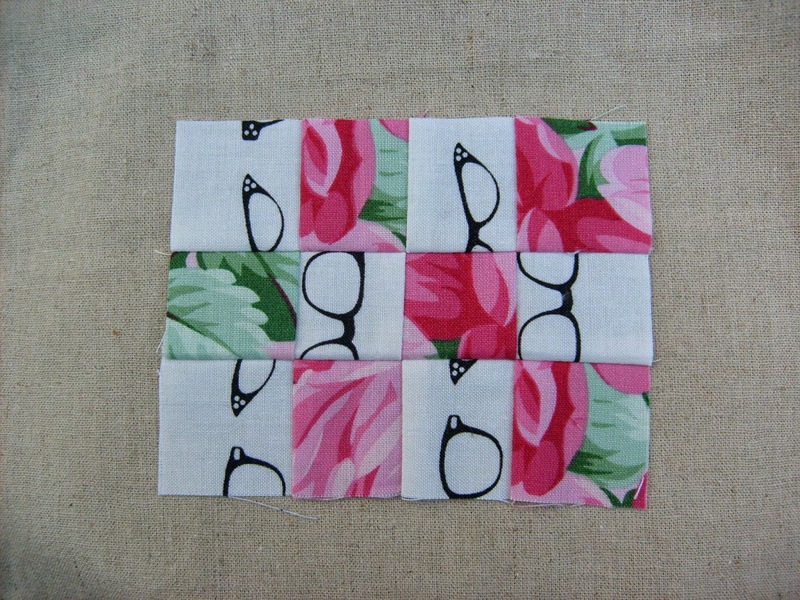 Hopefully I will be able to start sewing the blocks soon. 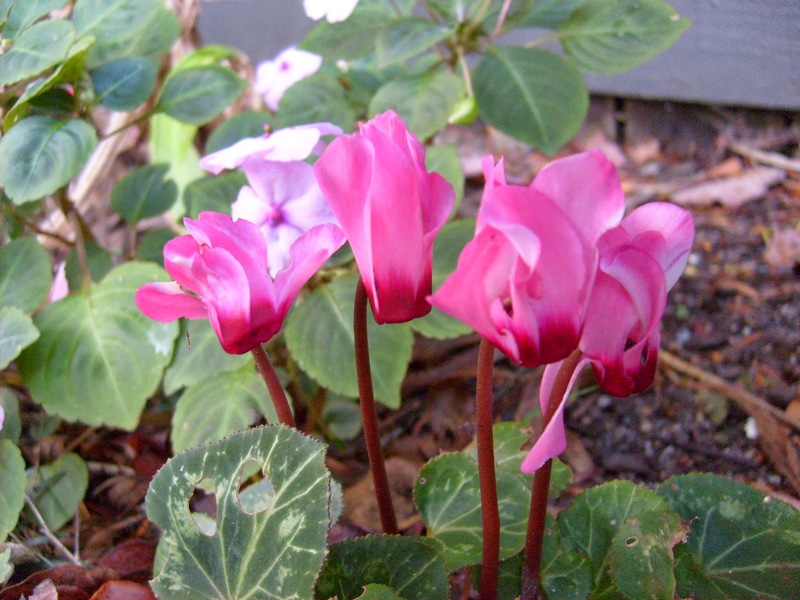 A surprise in my garden - a flowering mini Cyclamen. 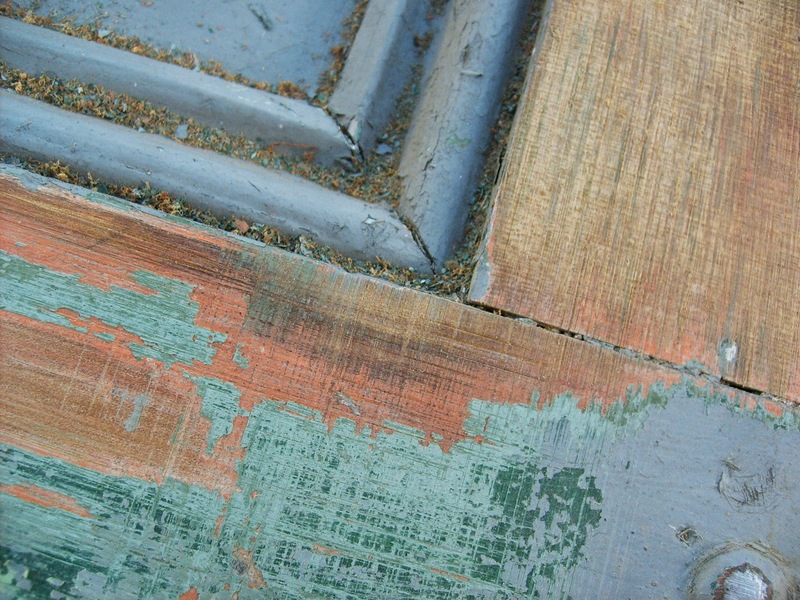 Revealing the woodwork, under layers of paint. The Scout has started sanding back the old door he bought me.We are hoping it will be able to be turned into a cutting table for my sewing room. 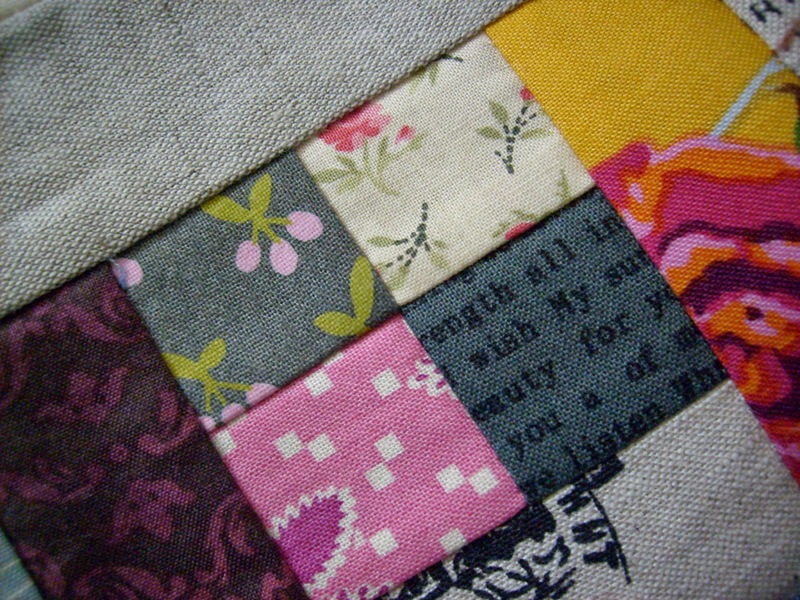 Tiny 4.5" blocks for a Flickr Quilt-a-Long. 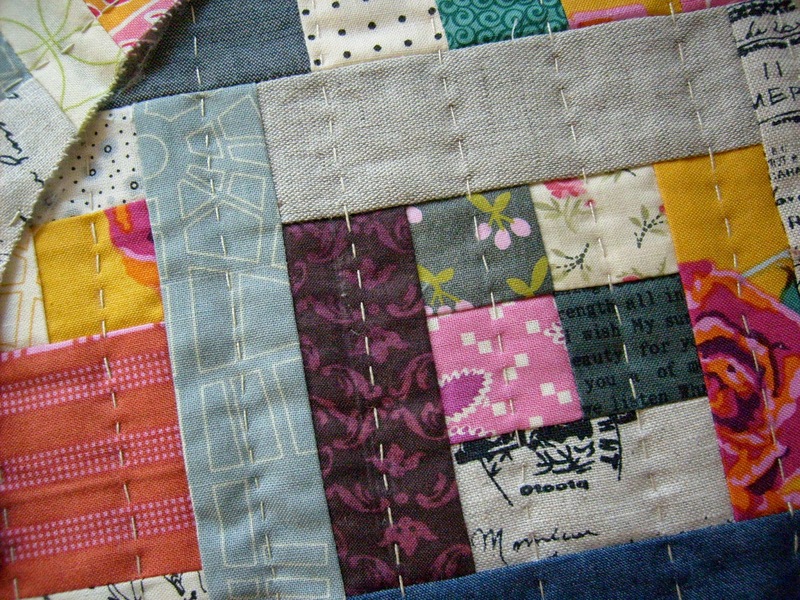 The idea is to use up scraps to make these blocks. We are given a theme each week. 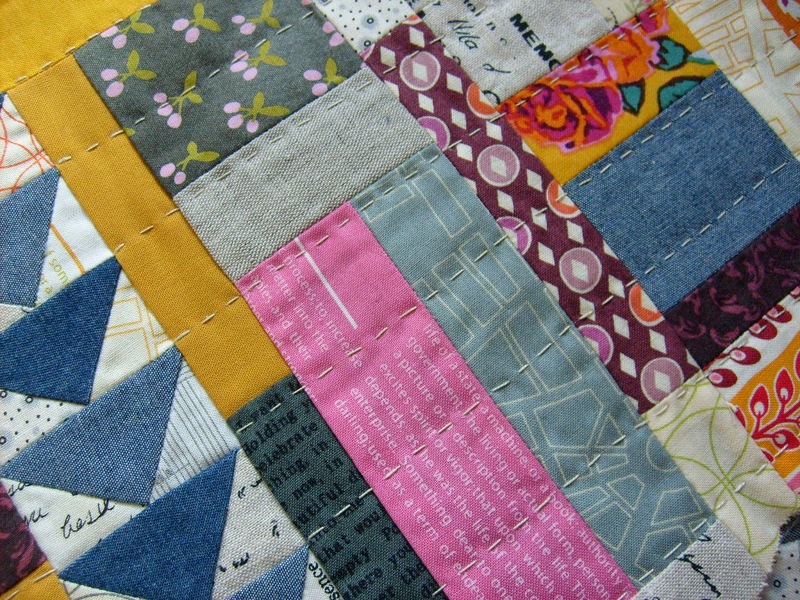 What have you made this weekend? 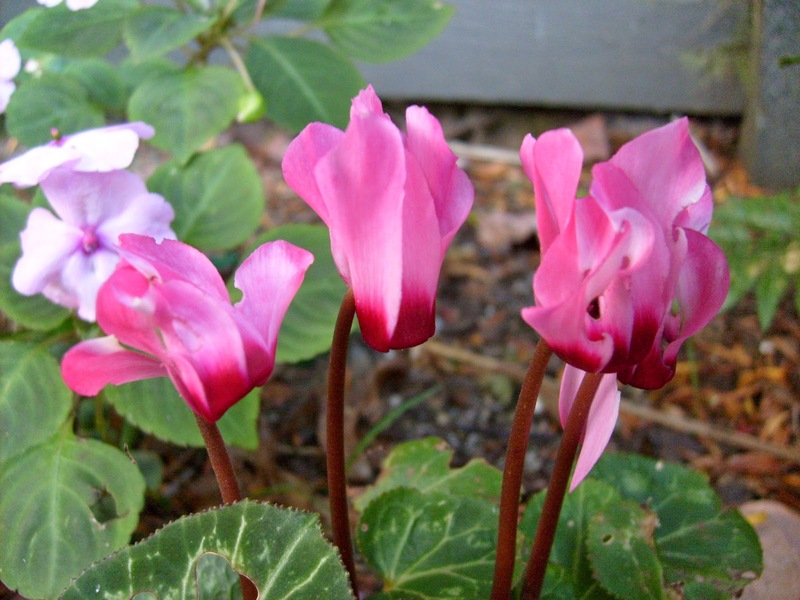 What is flowering/growing in your gardens? Decor: I like colour in my house, antiques, ornaments and other collectibles - bowls of shells, plants, pottery and ceramics, books and magazines - I could never live in a minimalist style house. 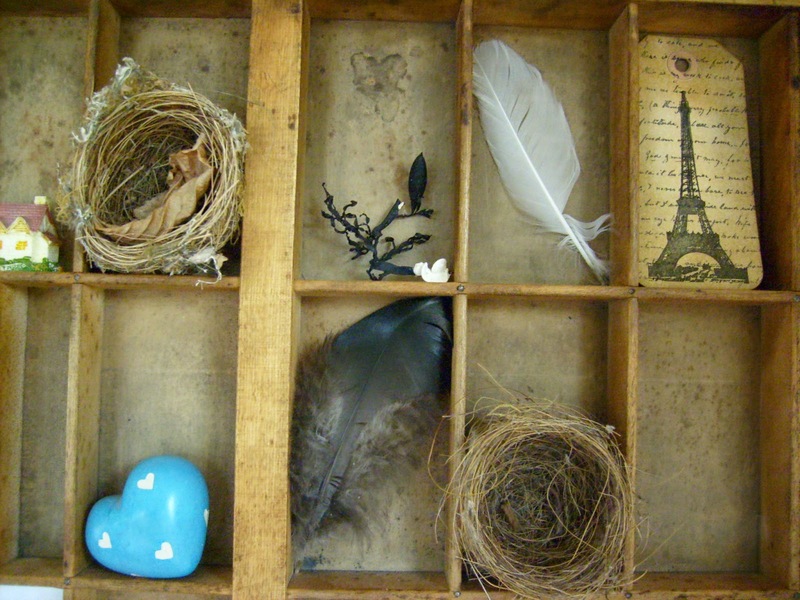 I don't think my house is cluttered, but it looks lived in and shows bits of the personalities of it's inhabitants. Recycled furniture and lots of wood feature heavily too. I describe my home decor style as a mix of urban country and vintage bach. 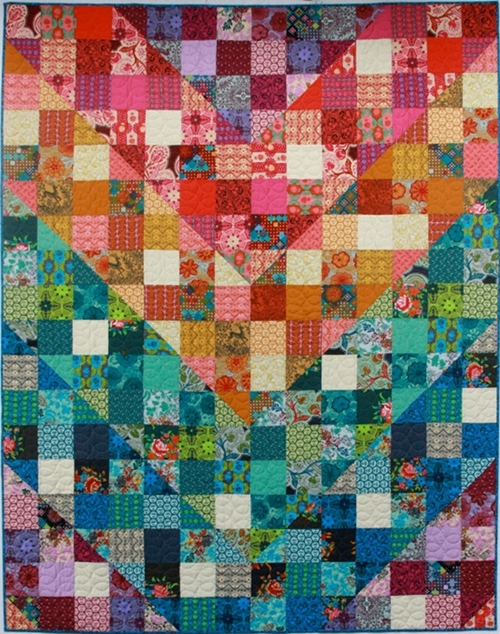 Sewing/Quilting: I love the look of bright colours against a linen/low volume background, but then I also like bright scrappy quilts or the almost jewel box explosion of colour in Anna Maria Horner fabrics and quilts. 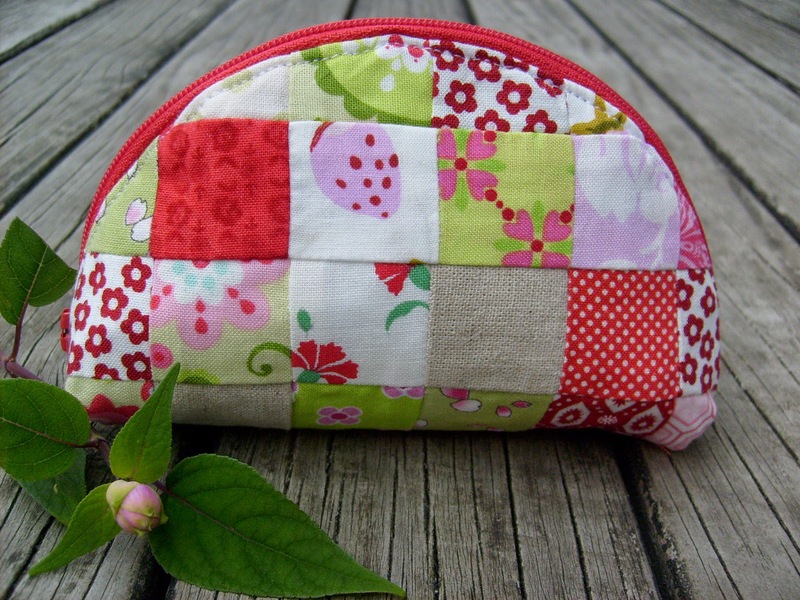 I love making little bags and pouches. Pillows too - none of which really tone in with my home decor (at this point anyway). I guess I create with the colours that make me happy, and I do sometimes struggle when making things for other people to work with colours they like. 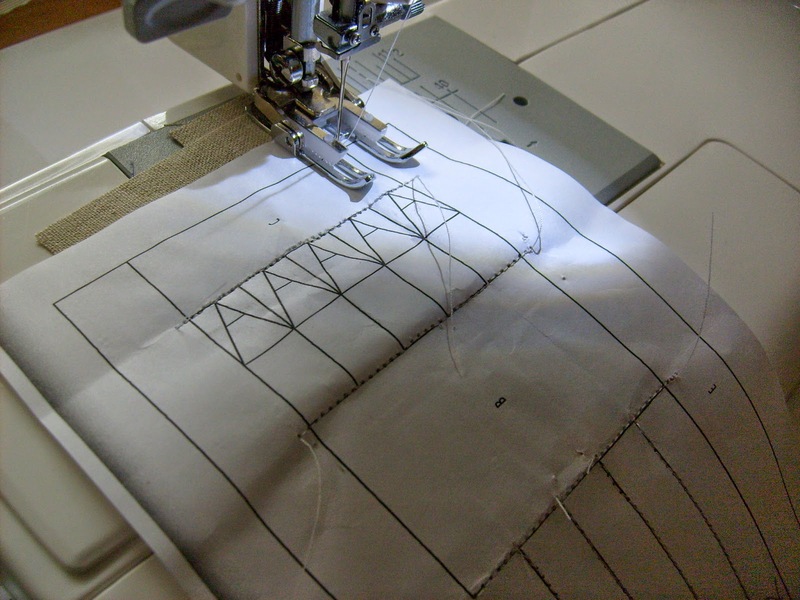 Though I may be inspired by other people's ideas and creations, ultimately it is my style that comes through, whether in my home, my dress or my sewing. What is your style? How would you describe it? One of my nieces has a birthday coming up soon. 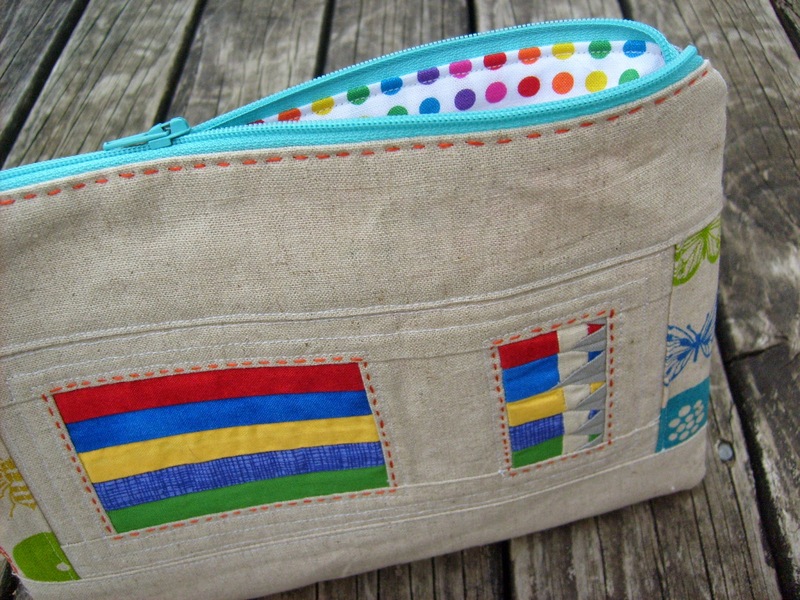 I couldn't think what to get her, so in the end decided to make a pencil case, which I will fill with nice pens, pencils and stickers. 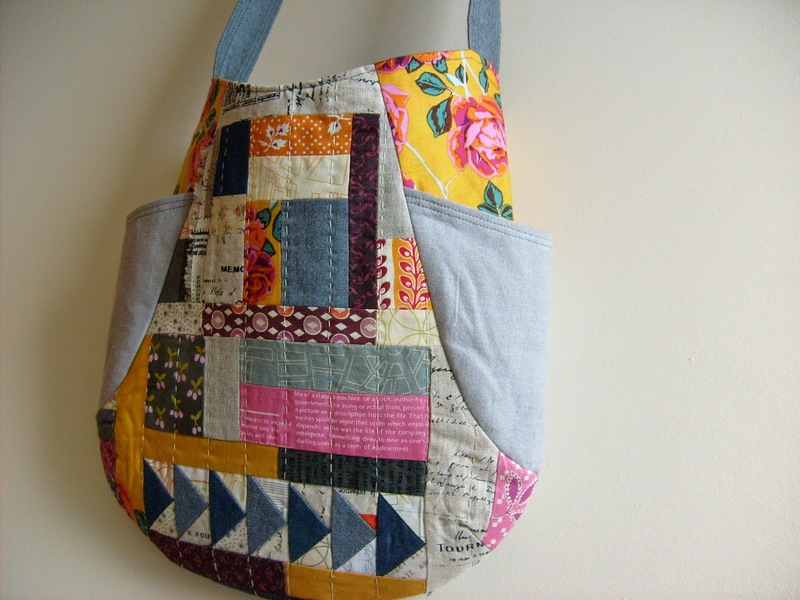 I used the paper pieced pencil pattern from Patchwork, Please, as the basis of my case and then just made it to my requirements. I made a slight mistake, which for some reason I didn't notice until too late on the pencil tips. 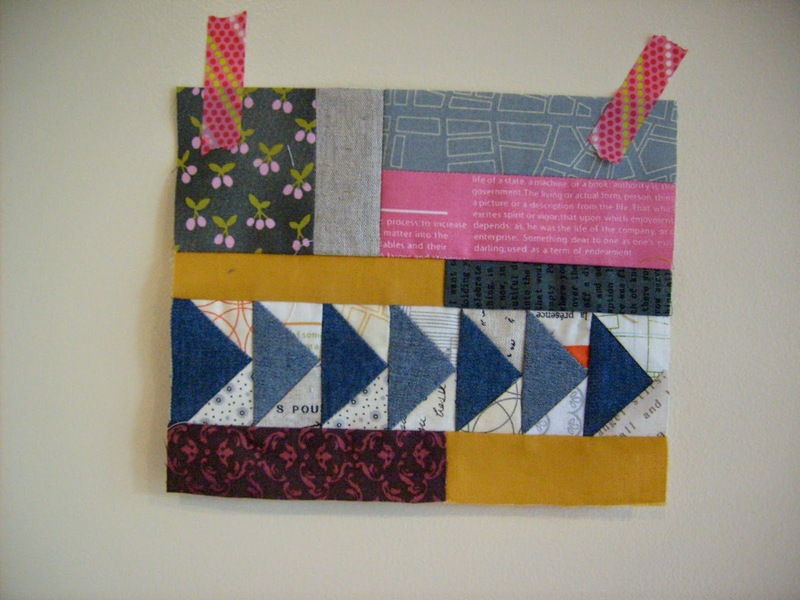 I didn't unpick it - I don't think the tiny paper pieced pencil ends would have survived that. 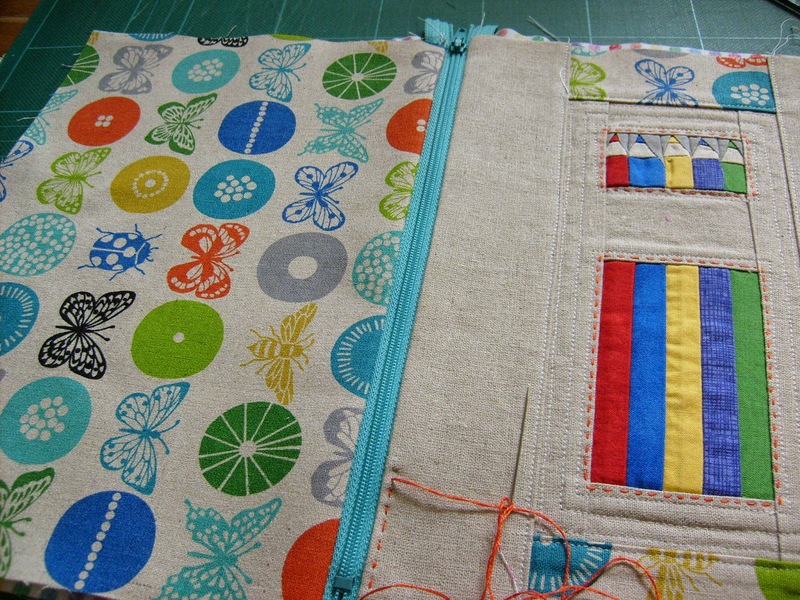 The back is some Echino fabric, and I have hand-stitched around the pencils and as top-stitching by the zip. 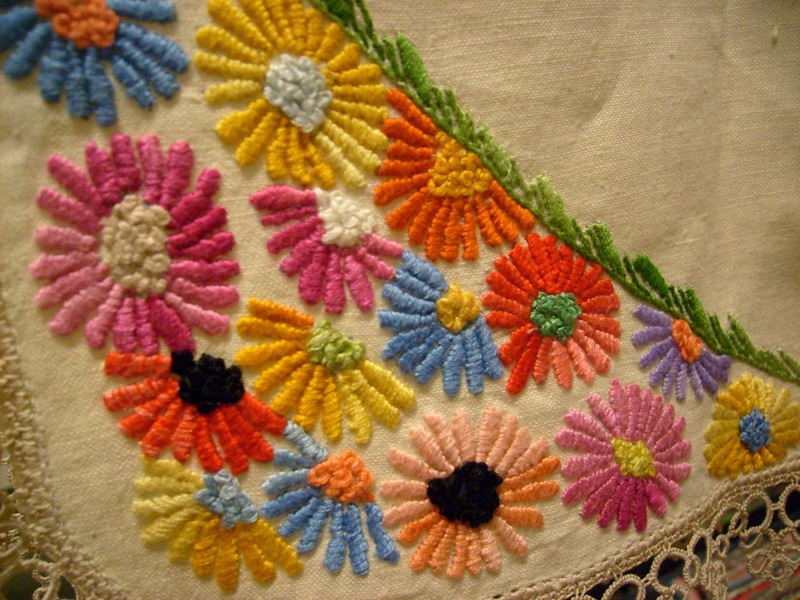 The lining is a nice bright multi-coloured dot. 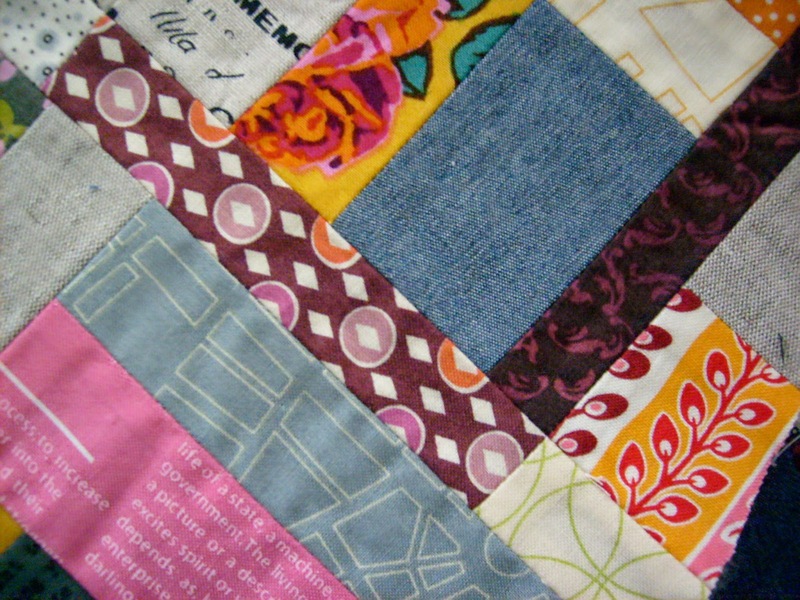 Finished size is 7"x10". 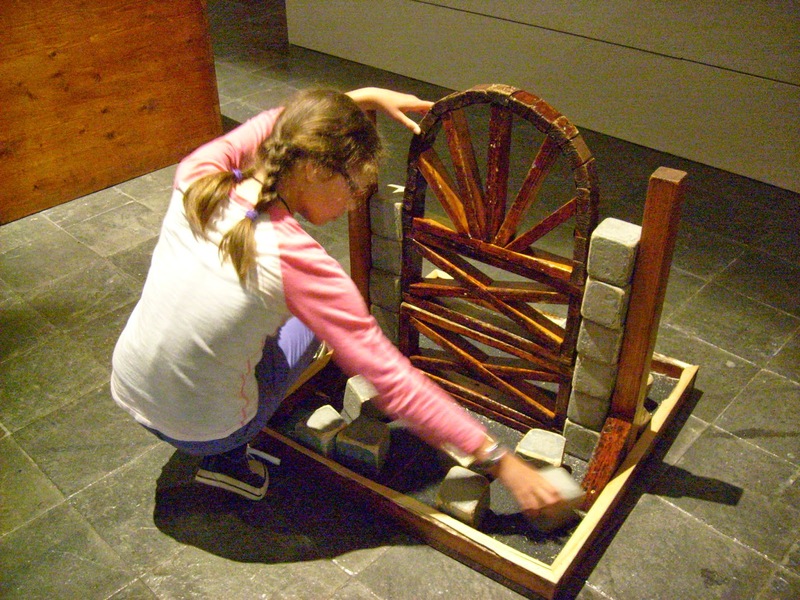 Just the filling of it to be done now, before it gets posted to Australia..
On Saturday, Miss B and I traveled to Hamilton to see the Roman Machines Exhibition at the Waikato Museum. Miss B is fascinated by Roman and Greek history and myths. 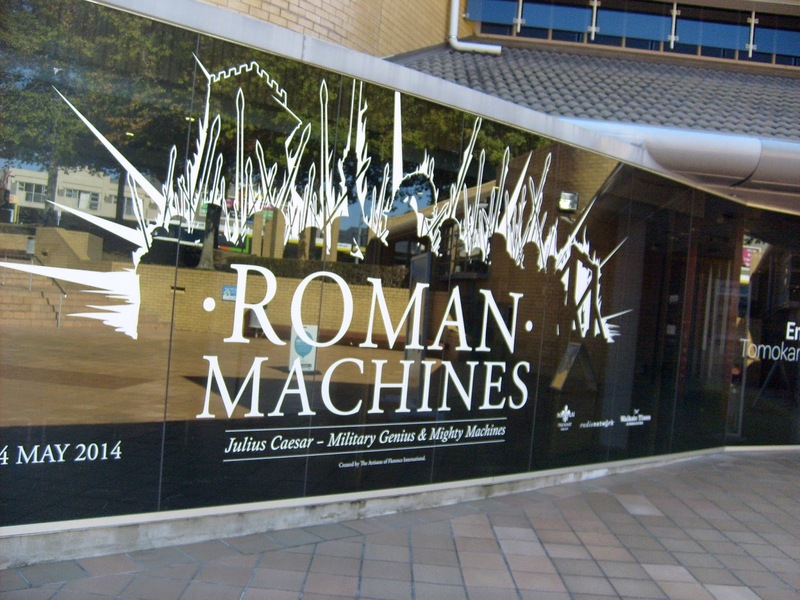 It was a very interactive exhibtion, we were able to see and try on old Roman armour and try operating some of the old style pulleys and grinders. We attempted building an arch too. 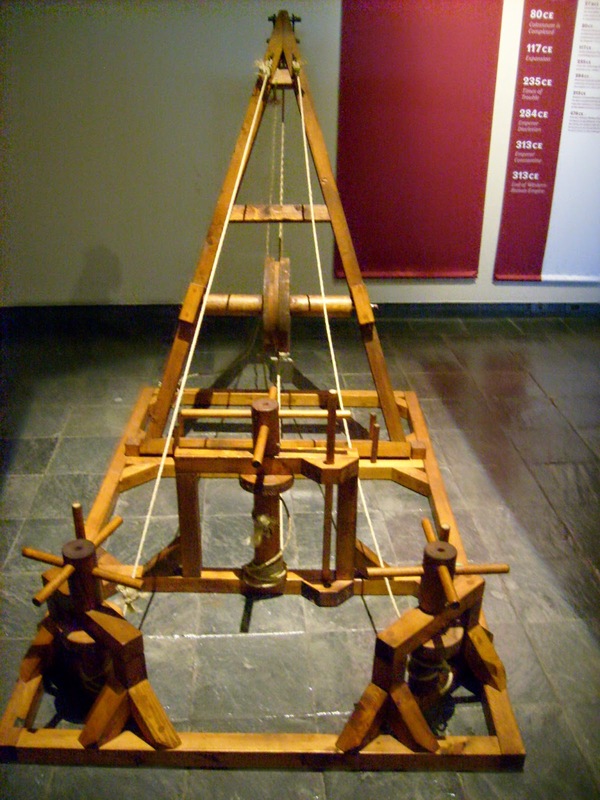 Another exhibition running was a display of vintage linen and needlework. 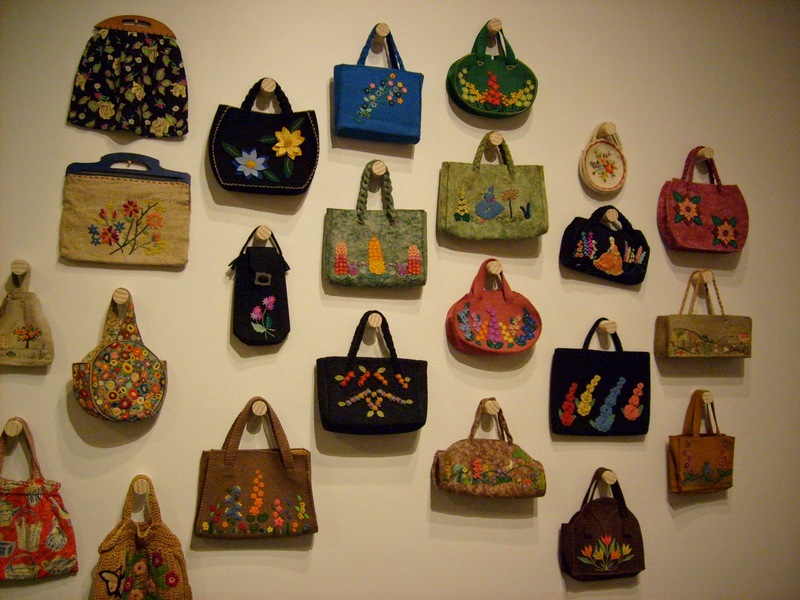 Some of the embroidery was simply stunning as was the collection of ladies house bags - these were often used as project bags for knitting or embroidery when visiting.. 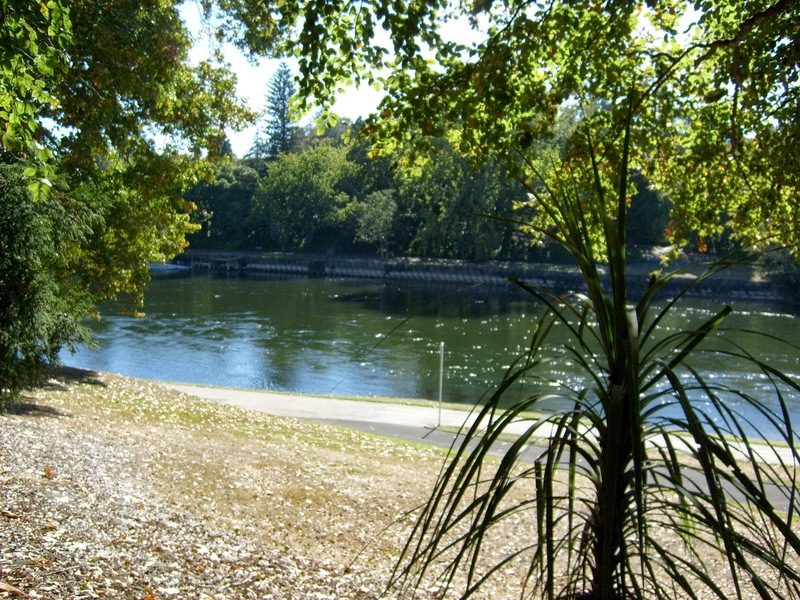 Lunch was eaten while sitting on a park bench watching the Waikato River flow by. 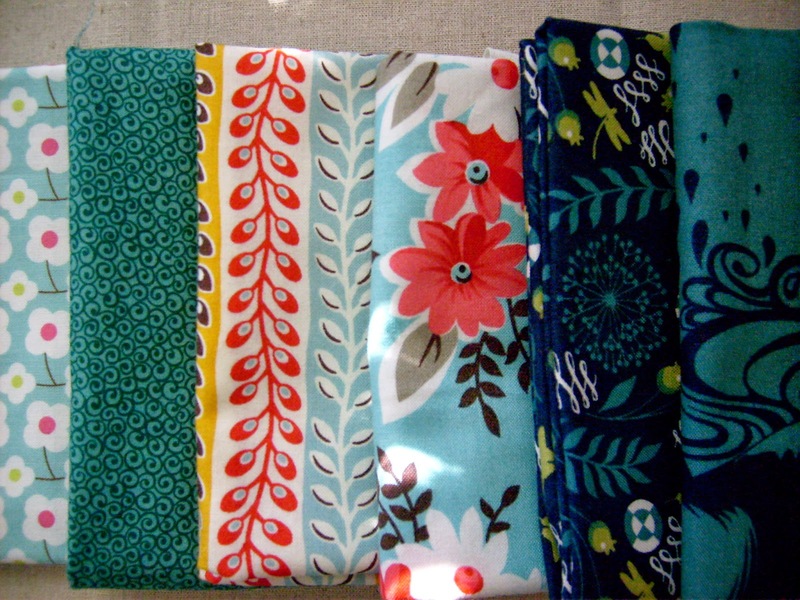 Of course a trip to a new to me, fabric shop was had too. Yes a little stash enhancement was done. 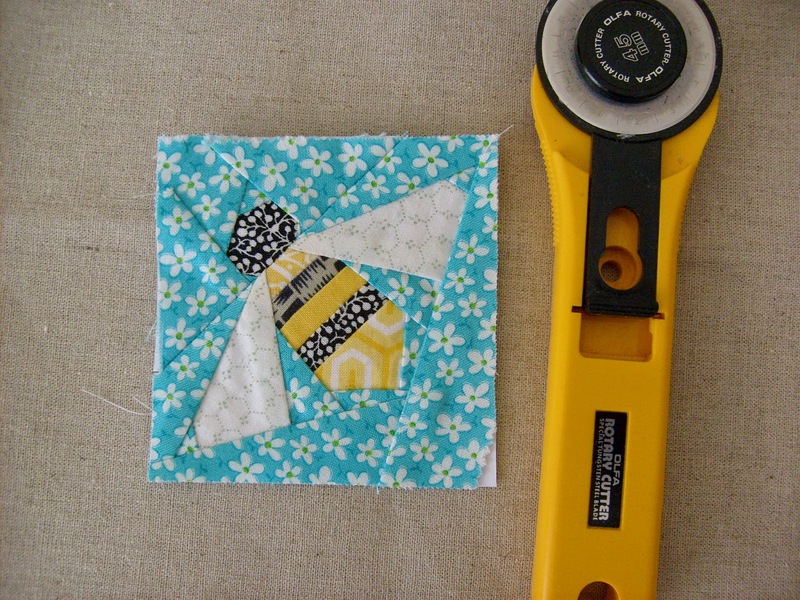 A little paper-pieced bee block - measuring 3" square, turned into a coaster ready to be mailed overseas. Pattern from here. 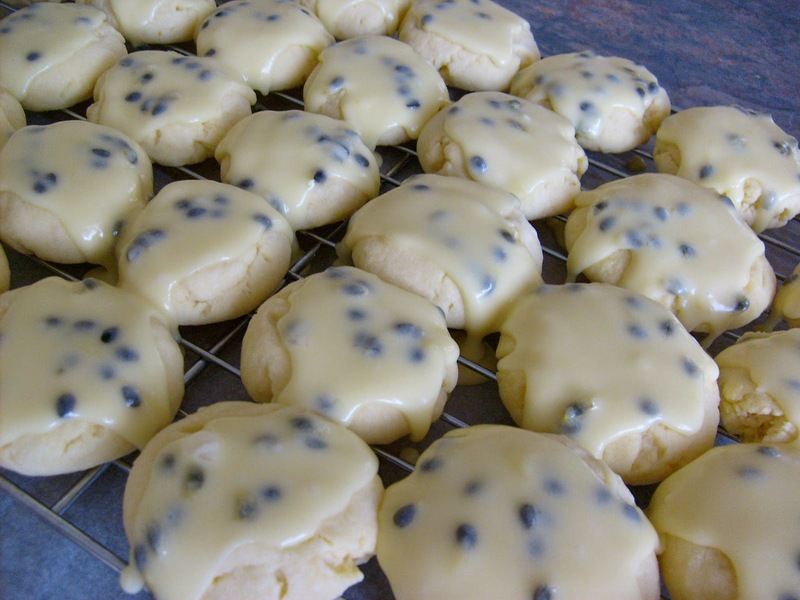 Some biscuit baking - Passionfruit Melting Moments, only I didn't sandwich them together with the icing. I get more biscuits this way. 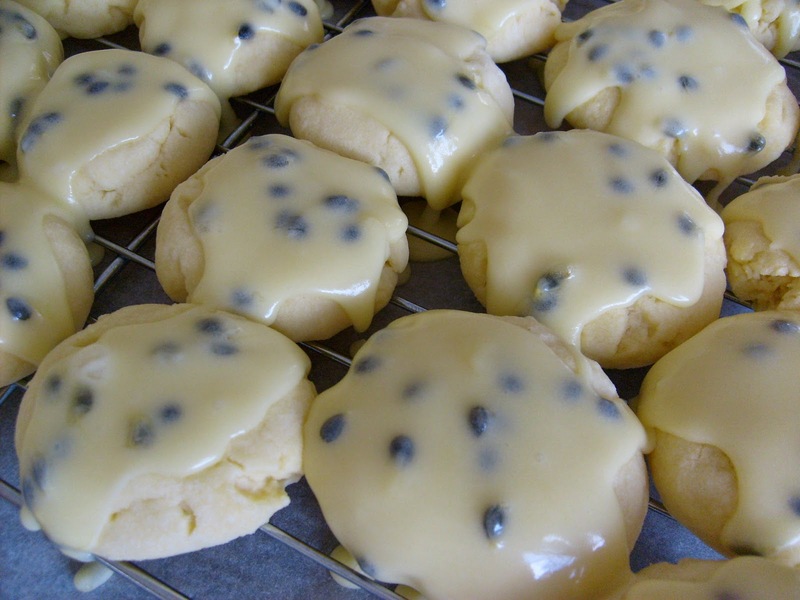 Recipe from here.